Today I decided to write a short post (as short as I can write them) about a product I personally love but haven't heard much about. I even read some negative opinions about it but still enjoy it very much. Since you read the title you know what this post is all about ;), so I'll start with my review. I've said this earlier but I really don't like eye makeup removers with oil in them. Just don't like that feeling on my skin. 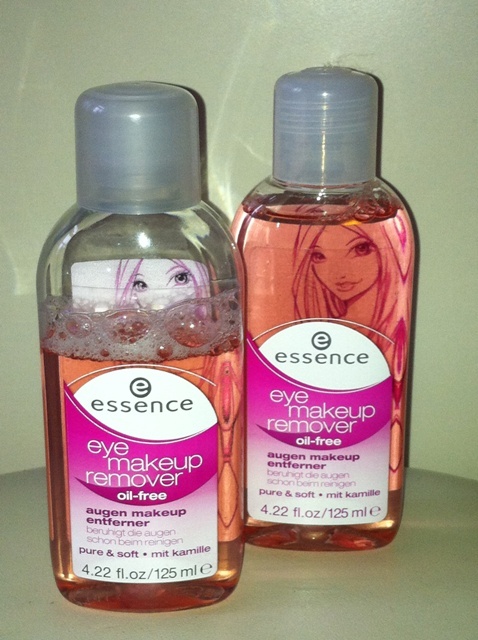 Essence has 2 versions of eye makeup removers and, of course, I went for the oil-free one. I wasn't planning to write a post about it but that would be unfair because it always has a place on my shelves. I used to use eye makeup remover (also oil-free) from Balea (it is DM's brand available in DM stores) and it was great but one time they didn't have it in the store so I tried this one and loved it even more. I even recommended it to friends of mine with sensitive eyes along with a tip on how to remove makeup from the eyes, and they loved it. So, everyone around me like this product, all the negative feedback I heard about it was from other beauty blogs and their readers. My opinion stayed the same: "LOVE IT!" It comes in a plastic 125ml/4,22 fl.oz bottle and it costs about 16kn/2 Euros/1,5 GBP or 3$. It is available in all drugstores and some of the high end stores, at least in Croatia. "This soft formula with chamomile extract removes especially gently non-waterproof eye makeup whilst soothing the delicate eye area, without oily residue so that fresh makeup can be applied immediately after.Usage: apply to a cotton pad and gently wipe over closed eyelid. INGREDIENTS: aqua (watera), glycerin, PEG-40, hydrogenated castor oil, propylene glycol, chamomilla recutita (matricaria) flower extract, bisabolol, poloxamer 184, lactic acid, butylene glycol, glucose, bht, sodium benzoate, potassium sorbate, phenoxy-ethanol, parfum, CI 16035. It is ment to remove non-waterproof makeup and that is probably the reason why so many people don't like it. I don't like, use or own any waterproof mascaras because I am terrified they'll ruin my lashes and also not a fan of them because taking them off can bee such a pain in the b.... On the other hand, I use it to remove waterprof eyeliners an eye pencils. It does a good job at that! I just don't follow the usage instruction written on the bottle, I go with my way always following the golden rule: "NO TUGGING!!!" Take a cotton pad and put enough product on it (not too much but be generous), then put the pad onto your eyelid (closed eye) and hold it there for 20-30 seconds, when you take it off you should already see that your mascara melted and the line of your eyeliner. With very light hand remove the rest of your makeup. If any of your eye makeup is left along the lashline take an ear cotton bud, put some product on it and remove the rest of your eye makeup. I always wash my face in the end with some kind of cleanser and water, just don't have that clean feeling if I don't do so. This product is really gentle to the eyes, it has a nice soft smell and I love it! What about you? Have you tried it? Like it? Don't like it? What do you use and would recommend? I wish you a great and successful week!